Slimming World Diary: Weigh In ..
﻿Okay so it was the dreaded weigh in day today, and I lost 2 and a half pounds! Woohoo ha ha. I was quite surprised by that and also ecstatic, I am now 14st 1lb, I need 1/2 a pound for my 2 and a 1/2 stone award and a 2lb to get into a number that I haven't been in years. I know I can achieve that next week! Today was taster week to start the 12 weeks to Christmas countdown, some lovely things to try. I made and brought in aromatic chicken bake. It consisted of a walk into town to buy ingredients so I got some body magic in today. 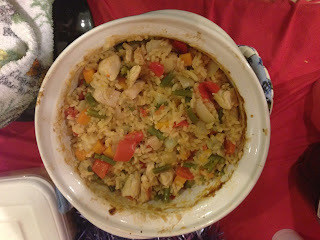 Then I got cooking, really easy one to make again since it all takes just over 30mins and it is all baked in one pot. I think it went well down at group since I made a full casserole pot and there was only about a quarter left. I thought it tasted great and I will definitely be making this one again! Also won the raffle tonight! First time ever, was quite excited. I won ingrediants to make a nice casserole or a chunky soup. chopped fresh flat-leaf parsley, to garnish. 2. Spray a large casserole pot with Fry Light. Add the chicken and stir-fry for 10-15 mins until golden on all sides. Add the onion, garlic and pepper to the pan and cook for 5 mins. 3. Stir in the tomatoes, carrot, green beans, cardamom pods, cloves, cinnamon stick , paprika and rice. 4. Add the stock. Season to taste, and bring to the boil. 5. Cover with lid and transfer to the oven and cook for 20-25 mins or until the chicken is cooked through and the rice is tender. 6. Fluff up the rice, sprinkle with chopped parsley and serve. Amazingly easy and syn free!